Posted on 6, April 2016 by EuropaWire PR Editors | This entry was posted in Industrial, Sweden, Technology and tagged crane, Henrik Strömbäck, Hiab, Rafal Sornek, virtual reality goggles. Bookmark the permalink. Malmö, Sweden, 06-Apr-2016 — /EuropaWire/ — Hiab, part of Cargotec, introduces as the first in the industry a new vision system, moving crane operation to the safety and comfort of the truck cabin. 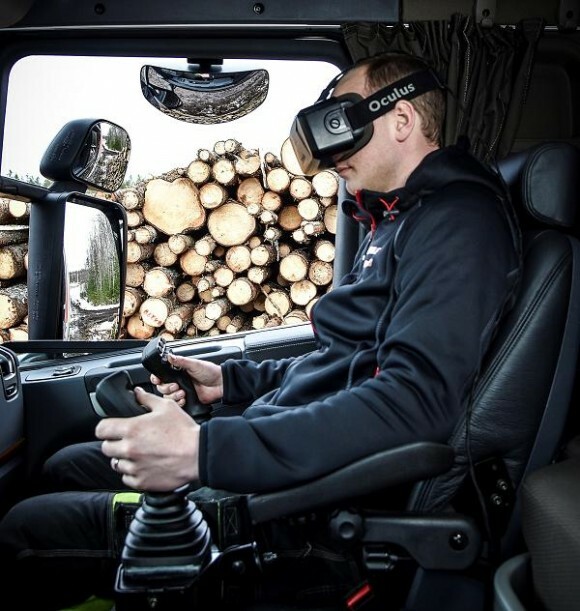 “Based on the recent advancements in virtual reality goggles, cameras, and connectivity we have developed a system with cameras on top of the forestry crane, which enables you to see the working area and operate the crane remotely using VR goggles – the HiVision(TM) 3D control system, which is unique in the industry,” says Rafal Sornek, Vice President, Technology & Quality Development, Hiab. There are four cameras located in a small box where the operator’s head would normally be to enable a realistic 240-degree view for the HiVision(TM) operator, who controls the crane from the truck cabin. When the operator turns his head the goggle image switches from two forward-looking cameras to two sideways cameras. Sornek has a clear long-term vision for HiVision(TM). “In the future the operator doesn’t even have to be in the truck, but operates remotely from a distance, saving costs. I’m a strong believer that we rather soon will have driverless trucks on the roads, and it makes no sense to have crane operators sitting on these waiting passively to get to the site. One person could even operate several trucks remotely,” he says. HiVision(TM) 3D vision control system gets it world premiere in Bauma exhibition, which takes place 11-17 April in Munich, Germany. Come and experience HiVision(TM) at our stand FN. 921/4 and FN. 1024/1 in Bauma! Hiab press event will be organised on Wednesday 13 at 1 p.m. on Hiab stand. As we have limited amount of seats available, please reserve yours to join the event by contacting Hanna-Kaisa.Talvensaari@hiab.com. We also have a media lounge available for the press during 11-13 April. The media lounge is located on the second pavilion floor of our stand.